This paper was presented at the Toronto Electroacoustic Symposium 2010, during the Instruments and Interaction session, chaired by Emilie LeBel. One of my objectives while composing music, especially music for digital musical instruments, is to provide a context where the performer can experience a process with his or her instrument. It is this process that connects the human agent to a means of expressing the magical language we call music. That is to say, a potential for musical expressiveness does not reside within the instrument — the gestural controller, input device or laptop computer — but can be evaluated and experienced as the result of the tangible connection between performer (the human agent) and his or her instrument (the means). 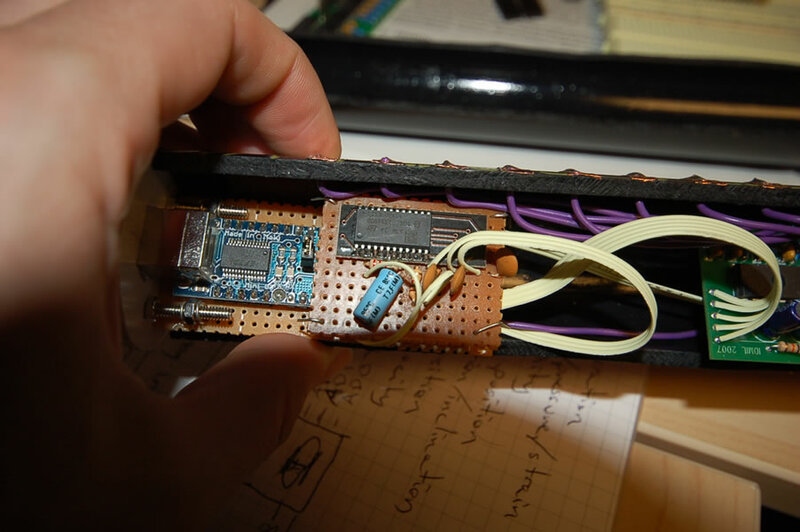 I begin with different descriptions of the T-Stick digital musical instrument, in particular, concluding with an explanation of the instrument “for musicians”. I also expose the real and palpable relationship between playing the T-Stick and experiencing musical process. I conclude with a description of present-day performance modes on the T-Stick and illustrations of gesture-to-sound concurrence and counteraction. 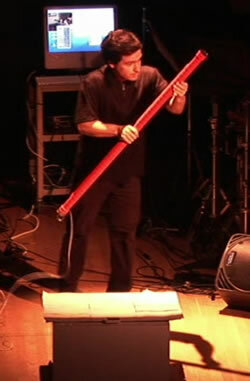 Figure 1: Fernando Rocha playing the tenor T-Stick in D. Andrew Stewart’s The One (2006). On the one hand, this instrument can be characterised as a pipe-shaped device — I have regularly had audience members comment on the resemblance of the T-Stick to the plumbing pipes found underneath a kitchen sink. On the other hand, the complexity of the instrument in relation to various contexts — technological and especially musical contexts in my case — necessitates a wide range of different methods for talking about the T-Stick. If possible, I first try to have my interlocutors see the instrument in action. Figure 1 shows the T-Stick prototype, a “tenor” T-Stick, being played in one of my first fully notated compositions for the instrument, entitled The One, in November 2006. My colleague, Joseph Malloch (T-Stick inventor), worked diligently on this early model with soldering iron in hand for hours and hours. Among other developments, his work led to printed circuitry for the T-Stick that substantially reduced the soldering time. I can attest to the ease at which we can now assemble a T-Stick. The performance of The One was also a good illustration of some of the earliest gesture-to-sound mappings for the instrument. Later, I deal with mappings and take particular notice of the shortcomings in mapping strategies in The One (see Flat Performance, below). audio delivery system (i.e., loudspeakers). Malloch describes the T-Stick in technological terms (e.g., QProx QT161 charge-transfer sensor ICs, STmicro LIS3L02AS4 3-axis accelerometer, etc.) in his contribution to the proceedings of the 2007 International Conference on New Interfaces for Musical Expression (Malloch and Wanderley 2007). For now, I want to move on to other methods of describing the instrument. From time to time, I have been asked to give a description of the T-Stick to artists who do not work with music as their first medium (e.g., theatre, dance, performance art). In these cases, I talk about the placement of the T-Stick in a general performance art lineage, which has consistently taken into account the nurturing of an integration of the arts and sciences. For example, Western performance art used the theatre as a laboratory for investigating the intersection among materials such as space, form, colour, light, sound, movement, time and other phenomena. Here, I am thinking of the experimentation at Black Mountain College in North Carolina in the 1930s. An interdisciplinary approach to art at the college was especially endorsed by college instructors such as Josef and Anni Albers and Xanti Schawinsky, all of whom shared a history with the Bauhaus. 2[2. The Bauhaus (first situated in Weimar, then Dessau, Germany) was a teaching institution for the arts with international notoriety (1919–32). The Bauhaus policy called for a unification of all the arts and a synthesis of art and technology (Goldberg 1979, 97).] 1948 was a particularly important year at Black Mountain because of the inclusion of two new tutors to the institute’s summer school: the composer John Cage and choreographer / dancer Merce Cunningham. The experimentation of Cage and Cunningham at Black Mountain advanced performance art in America and anticipated the so-called “happenings” and the formation of Fluxus in the 1960s. New directions proposed by John Cage, in particular, had a lasting effect on the “experimental music” of the 1950s and 60s, especially as they pertained to concepts of process and control in music. Consequently, an intersection of the doctrines of performance art and the evolution of music technology (circa 1950–60s) met in John Cage’s compositions such as: Cartridge Music (1960), Variations IV (1964), Variations V (1965) and Rozart Mix (1965). T-stick development has a direct link with this intersection of arts and sciences, evolving the scientist-like behaviour of Cage, Tudor and Mumma (in their realisation of Cage’s Variations V) into the normative performance behaviour of musicians (Figure 3) — this is an “evolution” in my opinion. The remainder of this paper is about describing the T-Stick in terms / contexts that are used by musicians, who more often than not have a lesser understanding of technology and a greater appreciation of, or intuition about, playing musical instruments. When I describe the T-Stick to musicians, I begin with the following. The T-Sticks form a family of tubular digital musical instruments, ranging in length from 0.6 m (soprano) to 1.2 m (tenor). They have been designed and constructed to allow a large variety of unique interaction techniques such as: touching, gripping, brushing, tapping, shaking, squeezing, jabbing, swinging, tilting, rolling and twisting. As a result, a significant emphasis is placed on the gestural vocabulary required to manipulate and manoeuvre the instrument. The musical experience for both the performer and audience is intensified by a unique engagement between performer body and instrument. Additionally, they are designed for the use of expert users. To this end, more emphasis is put on extending any “ceiling on virtuosity” rather than on lowering the “entry fee.” New users should be able to produce sound from the T-Sticks, but not necessarily musically pleasing sound. The instrument design of the system aims at keeping the performer’s focus on the sound and its relation to the entire instrument, rather than individual sensors. Technological concerns are subsumed under performance or musical concerns. The sound of the T-Sticks are entirely synthesized in real time without any type of automation, live score-following or computer-assisted composition. In addition to this non-technological description of the T-Stick (e.g., designed to allow interaction techniques such as: touching, gripping, etc. ), I emphasise the empowering effect of being able to enact a musical process. Performing a musical process is intrinsic to the handling of any acoustic musical instrument and is essential in evolving a control surface into a viable digital musical instrument. Moreover, it is the controlling of this process — or attempt at control — that leads to satisfying musical expressiveness for both the musician and the audience. In other words, a device (an input device, gestural controller or even a musical instrument) is not expressive in its own right; the potential for musical expressiveness does not reside “within” the object. Rather, expression can be evaluated or experienced as a the result of the tangible process between performer and his or her instrument. In the next section, I will discuss mapping strategies, since mappings are the liaison between performer and instrument and ultimately determine what processes are actually exercised. Many authors have described our understanding of music-making as fundamentally a physical act. Our physical movements are understood to unleash sounds, creating a clear cause / effect coordination among gestures and sounds. In mapping for the T-Stick, I have maintained this clear cause / effect correspondence for the most part. In addition, I make an effort to integrate physical gesture with the more abstract and complex sonic behaviours we find in electroacoustic music. For instance, for a physical movement that has a clear beginning and ending (e.g., thrusting the T-Stick in one direction), I normally coordinate the gesture with the onset of a new sound, although I think it is important that the sound sometimes has a complex decay structure (e.g., a variable decay time or secondary onsets) that is not necessarily clearly linked to the ending — the decay — of the initiating physical gesture. For more continuous and fluid movements, I coordinate the expanse and geometry of the physical gesture with the higher level structure of the sound. For example, a combination of continuous tilting and rotating — a circular movement that I sometimes refer to as “lasso” — might induce a similar continuous and circular (repetitive) sonic motion and growth. In this case, the outcome of my mapping is focussed on my conveying the higher level motion of the sound and not controlling the “inner” details (e.g., discrete frequencies, onset times, changes in amplitude of individual frequency ranges, etc.). These distinctions are summed up by the terms concurrence and counteraction. 3[3. Presently, I am a postdoctoral researcher at Concordia University. The title of my research is “Concurrence and Counteraction in Digital Musical Instrument Composition and Performance.”] That is to say, the degree with which physical gestures concur or counteract sounds must be an ongoing consideration while developing mappings. Furthermore, I believe concurrence and counteraction are essential to the compositional process and ultimately help in forming the materials of a piece — instrument mapping and compositional mapping become intertwined. Video 1 (11:37). D. Andrew Stewart — The One (2006), for tenor T-Stick. Performed by percussionist Fernando Rocha in the Tanna Schulich Hall (McGill University, Montréal), November 2006. In order to illustrate my ideas about concurrence and counteraction, I want to discuss my composition, The One. As I mentioned above, this piece is an example of some early mapping strategies, primarily developed with the percussionist Fernando Rocha via the McGill Digital Orchestra project (Pestova et al 2009). Despite Rocha’s impressive interpretive skills — he is playing a pipe — and my effort to compose some musical ideas, a misbalance between the quantity (and energy exertion) of physical gestures and the quantity (as well as quality) of sounds creates a flat performance experience (Video 1). I believe Rocha’s T-Stick playing exhibited a great degree of perceptible energy exertion and consisted of a large number of movements: frantic shaking, concentrated squeezing (squeezing the centre of the T-Stick with two hands), slapping and tapping, hand swapping (sometimes in an awkward manner), tilting, etc. However, the number of sounds was far fewer than the number of movements. Moreover, sound colour lacked the diversity we observed in Rocha’s physical presence. In short, the physical gestural language was more developed than the sonic language and as a result, we were hard pressed to find logical concurrences or purposeful counteractions throughout the performance. This is not to say that The One illustrated an ambiguous cause / effect coordination among gestures and sounds; we clearly perceived Rocha’s role in initiating sound. However, sound variation was lacking in relation to the performer’s continuous and fluid manoeuvring of the T-Stick and thus, musical expressiveness was thwarted — leading to a flat performance. I want to end this section by reiterating that my evaluation of this performance as “flat” is a reflection of the preliminary gesture-to-sound mappings as well as choices of sound and is not a comment on the performer’s playing abilities. Video 2 (9:14). D. Andrew Stewart — Everybody to the Power of One (2008), for soprano T-Stick. Performed by the composer. 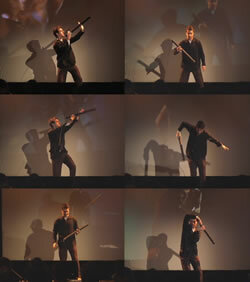 I premiered my next solo for “soprano” T-Stick in September 2008. 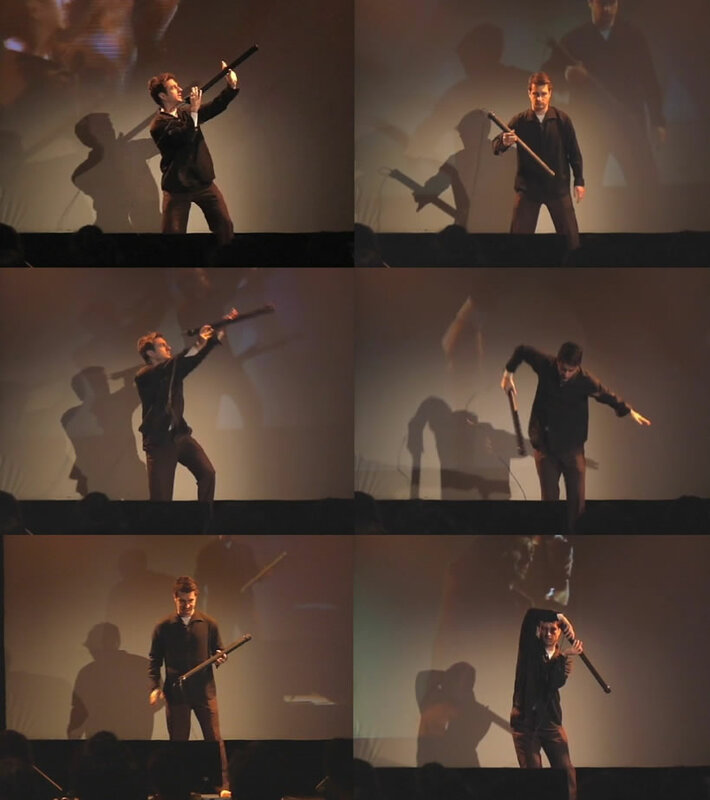 Figure 4 shows a number of photos from the performance of this composition, entitled Everybody to the Power of One (Video 2).This work is indicative of the improvements in mapping strategies, which have followed the ongoing advancements in T-Stick development. In contrast to The One, the quantity and diversity of physical playing gestures in Everybody to the Power of One is well-balanced with the quantity and diversity of T-Stick sounds. For instance, the starting segment, which constitutes almost one third of the piece, consists of vigorous thrusting in all directions; the thrust does not only entail mapping a strong energy acceleration to a sonic result, but also mapping tilt, rotation, grip pressure and hand position to sound synthesis parameters. All of these diverse and intricate physical gestures function concomitantly to generate a variety of different T-Stick sounds. With regards to concurrence and counteraction, a clear cause / effect coordination among gestures and sounds is maintained throughout the piece. Effective mapping strategies must permit the playing of similar sounds via a number of similar playing gestures. However, audience members have commented that I play a single sound in more than one way. Because the T-Stick does not (yet) give a reading of absolute position in space, I can often play similar sounds even when T-Stick orientation changes — when the proximity and orientation of the instrument change in relation to my body. I consider this sort of manoeuvring as an essential attribute of counteraction. That is to say, it is important that audience members perceive the normative cause / effect concurrence among gestures and sounds, as I have mentioned above, in addition to some gestures that seem to counteract their expectations. It is through this counteraction that a musical tension is developed, leading to mapping at the compositional level — mapping musical material to the musical project. This would suggest that the toddler discovering the piano for the first time is also discovering his or her role in shaping the sonic environment — the child is empowered. The same kind of sonic bliss happens when you play the T-Stick for the first time, but after mastering both malleable and intractable playing techniques, a sense of accomplishment and satisfaction is added and the feeling of power or influence over the sonic environment is increased. This is a very concrete and palpable effect due to the aspects I have mentioned here: the clearly physical interaction techniques, the inherent process exercised by a performer on his or her means, the cause / effect coordination among physical gesture and sound and understanding the implication of a gesture concurring with or counteracting a sonic result. Advancing T-Stick technology and extending the shelf life of the instrument — guaranteeing a robust lifespan for a robust digital instrument — is an undertaking I wish to share with the electroacoustic music community. 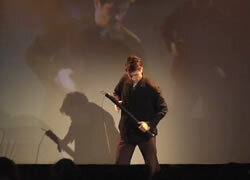 Consequently, in the fall of 2010, I held “inaugural” T-Stick Composition Workshops in Toronto, Montréal and New York. The workshops brought together a set of visionary composers from the United States and Canada to develop new live electroacoustic solos for the soprano T-Stick digital musical instrument. The workshops focussed on exploring musical and physical playing gestures and included the development of new playing techniques and sounds for the instrument. I wish to express my gratitude to the Input Devices and Music Interaction Laboratory and Joseph Malloch for their ongoing support of my T-Stick performance and compositional practises. I also wish to thank Professor Sean Ferguson for his leadership role in the McGill Digital Orchestra project. Without Professor Ferguson’s intervention, Joseph Malloch and I would have never begun working on the T-Stick project. In addition, I wish to acknowledge the organizations that have hosted the T-Stick workshops: Hexagram-MATRALAB, New Adventures in Sound Art (NAISA) and the Electronic Music Foundation. Goldberg, Roselee. Performance Art: From Futurism to the Present. Singapore: Thames & Hudson, 2001. Malloch, Joseph, and Marcelo M. Wanderley. 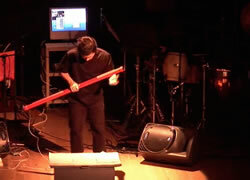 “The T-Stick: From Musical Interface to Musical Instrument.” NIME 2007. Proceedings of the 7th International Conference on New Instruments for Musical Expression (New York: New York University, 6–10 June 2007). Pestova, Xenia, Erika Donald, Heather Hindman, Joseph Malloch, Mark T. Marshall, Fernando Rocha, Stephen Sinclair, D. Andrew Stewart, Marcelo M. Wanderley and Sean Ferguson. “The CIRMMT / McGill Digital Orchestra Project.” ICMC 2009. Proceedings of the International Computer Music Conference (Montréal: McGill University — Schulich School of Music and the Centre for Research in Music Media and Technology [CIRMMT], 16–21 August 2009), pp. 295–298. Rouget, Gilbert. Music and Trance: A Theory of the Relations Between Music and Possession. Trans. Brunhilde Biebuyck. Chicago: The University of Chicago Press, 1985. 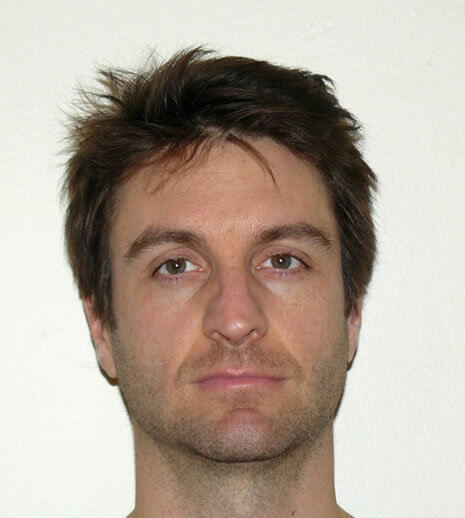 D. Andrew Stewart is a post-doctoral researcher at Concordia University’s Hexagram-MATRALAB. He is a composer, pianist, clarinettist and digital musical instrumentalist. Since 2000, he has been pursuing a career in gesture-controlled performance, after developing his own sensor-suit while living in Paris. Stewart has expertise in current and earlier digital instrumentalities (e.g. SonicJumper; T-Stick; Rulers; Buchla’s Lightning; JazzMutant Lemur; Méta-Instrument). His work centres on combining acoustic and digital instrument composition, establishing performance practises for digital instruments and developing class curricula that focus on student learning. His music has been featured by the Winnipeg Symphony Orchestra, Esprit Orchestra, Penderecki Quartet, Toronto New Music Concerts, Ensemble contemporain de Montréal, musikFabrik, Ensamble 3 and ROSA Ensemble. He has presented his research at the Conference on New Interfaces for Musical Expression, Toronto Electroacoustic Symposium, Electroacoustic Music Studies Network conference and the International Computer Music Conference.